As you might remember from the last time I documented my adventures in the Marvel universe, reading the most recent Storm collection made me curious about the X-Men. As I usually do when in doubt, I turned to Memory: she reassured me that it was okay to start wherever (one of the key rules of the X-Verse, it turns out, is that chronology doesn’t matter because time travel), and, knowing my preferences, recommended Marjorie Liu’s excellent series about mutant girls. 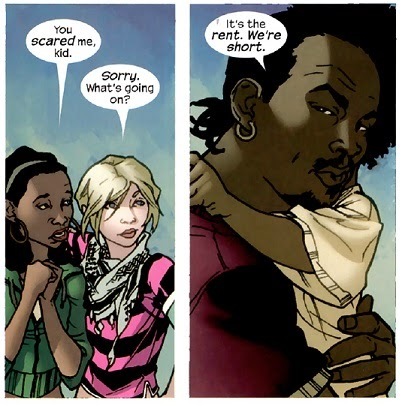 Three TPBs doesn’t make me an expert by any stretch of the imagination, but in case you’re wondering what I make of the X-Verse so far, here it goes: I really like the emphasis on stories about identity, belonging and inequality. The stories seem grittier than the ones surrounding the Avengers and friends — this isn’t a bad thing in itself, but I did miss the sense of fun I’ve come to enjoy about Marvel comics. On the other hand, their political subtext is generally closer to my sensibility. I liked the books below quite a lot, but I think that in the end they weren’t quite as strong as Captain Marvel, Ms Marvel, She-Hulk, and the rest of the lady-centric superhero comics I’ve been reading recently. Which is fine, of course — I still had fun with them, and I look forward to continuing to get acquainted with the X-Men. There was a character primer at the end of the first of these comics that allowed me to catch up with Hope Summers and her very complicated, time travel-filled backstory — this was a good and necessary thing. 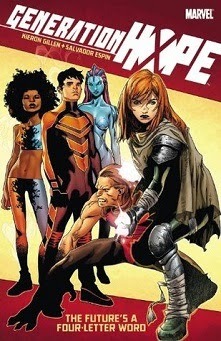 The Future is a Four-Letter Word is a mini-series penned by Kieron Gillen (the reason why I read it) with close connections to major events in the X-Verse. It’s not really a standalone, but the important Marvel lesson I’d learned previously was particularly useful here: as long as you’re okay with allowing context to fill in the gaps you’ll be just fine. Hope Summers, a mutant teenager, returns from the future and helps round up the first four x-men to be born since the day when all existing mutants were stripped of their powers. The members of this group, known as the Four Lights, need time and help and support so they can stop feeling like monsters, and so they can find somewhere where they belong. 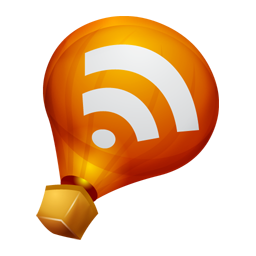 Throughout the mini-series, we watch them go through this process with varying degrees of success. I liked that this was a story about women helping other women and forming meaningful relationships (I’m nothing if not constant in my preferences, it seems), but in this particular case I was less sure about some of the political subtext. Take, for example, the panel below, where Hope says, “Thinking we’re the ‘gifted’ ones… we need to be able to get past that. We’re all just people. They’re all just people. And people who don’t see that, they’re part of the problem. The ‘gifted’ and the ‘ungifted’ is just ‘us and them’. That’s what’s wrong.” On the one hand, I’m in favour of appeals to common humanity and of challenging a specialness narrative with potentially damaging consequences. On the other hand, I believe this can be done while still acknowledging that identity is not necessarily divisive, and I’m very, very wary of narratives that veer in that direction. From what I gather about the X-Verse, mutants have been repeatedly discriminated against and violently persecuted. This means that the circumstances of their world do make them different, and there’s strength to be drawn from coming together and sharing these experiences. This can of course be done without defaulting to “actually, the majority that has turned on us are the ones who are inferior”, and I wish the story had done a better job of acknowledging this. 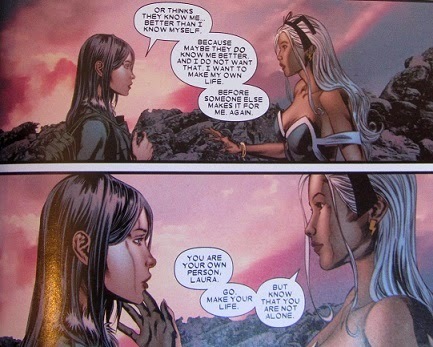 Nyx: No Way Home was my favourite of these comics. It has a far less epic scope than Hope Summers’ story: instead of being at the centre of things, this comic is concerned with kids who slip between the cracks; whose lives are lived outside all formal systems and institutions of the X-Verse. 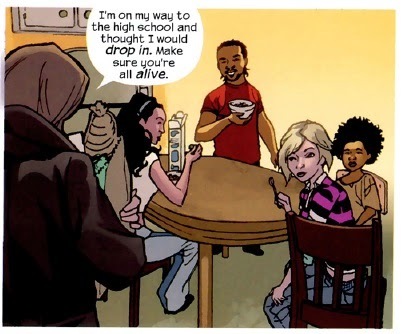 Kiden, Tatiana, Bobby and Lil’Bro may have powers, but they’ll never go to Jean Grey School for Higher Learning. They’ll never get to set foot in the X-Mansion. They’re four homeless kids trying to survive in New York City, forming a family of their own choosing, and doing their best to make it together. There are, of course, complications along the ways (like oh, say, being framed for murder), but Nyx: No Way Home is first and foremost a personal story. I loved all the characters and their careful negotiation of what’s expected of them, I was intrigued by Cecilia Reyes’ appearance, and I finished the book determined to read more Marjorie Liu. 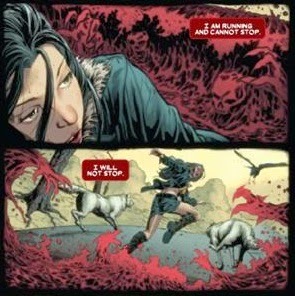 X-23: The Killing Dream was the darkest of these comics. It’s about Laura Kinney, a clone of Wolverine who was created to be an assassin. Laura has done a lot of horrific things in her short life; when we meet her in The Killing Dream, she’s struggling to live with them and to accept that she gets to be her own person from now on, with all the complications inherent to this. I’d recommend this book to anyone interested in stories about women who occupy the kind of terrain traditionally reserved for male characters: ethically ambiguous but still sympathetic, full of shades of grey, and in possession of both a conscience and a dark past. There aren’t enough stories about girls and women like Laura (at least not ones where they don’t end up horribly punished), so I’m always happy to come across a new one. If you like, say, Faith’s redemption arc in Buffy The Vampire Slayer, then X-23 is for you. …about an outsider, a young woman who belongs nowhere; it is about young women who fight, who tame, who are consumed—and who become monsters in their own right. I wanted to tell a story that encompasses all these things, and more. A story about women, young and old, picking up the pieces after surviving the horrors of war—and finding a home for themselves in a world that has otherwise exploited them. All the monstrous ladies: bring them on. From what I gather about the X-Verse, mutants have been repeatedly discriminated against and violently persecuted. This means that the circumstances of their world do make them different, and they’re strength to be drawn from coming together and sharing these experiences. This can of course be done without defaulting to “actually, the majority that has turned on us are the ones who are inferior”, and I wish the story had done a better job of acknowledging this. To me, this is one of the most fascinating things about the mutant metaphor—how, in some writers' hands, it can end up like this. Part of it is because the anti-mutant sentiment in the comics is not as virulent and violent as it was in the eighties. 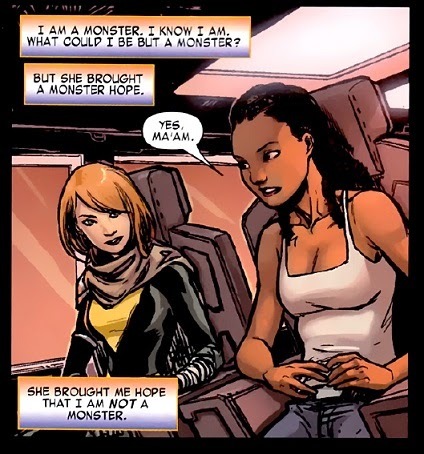 There's been an uptick in mutants who do not want their mutant identity to be the most visible part of them, but, tellingly, these characters—Hope Summers here and Alex Summers here— are mutants who can pass as regular humans. They're privileged in a way that a lot of mutants aren't, so they have the luxury of making these statements. 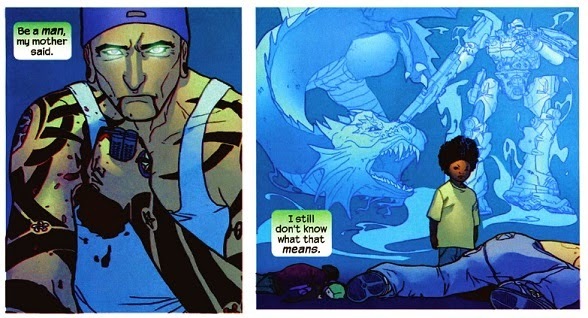 Kitty Pryde has a wonderful retort to Alex's statement in All-New X-Men #13, which you can see here. That's absolutely wonderful - thank you so much for sharing it. (Also, clearly I need to get to know Kitty better). You make an excellent point about privilege and how Hope can afford to say that when a lot of other mutants can't. Wonderful. Just wonderful. And Monstress sounds like a must-read. I started reading X-23, and it was, I dunno, too something for me. I wasn't wild about the art style, and I wasn't totally sure about the story either. I read something else by Marjorie Liu instead, and I quite liked it. Nyx and Generation Hope both look awesome though. I will read them NOW as I have that one-month trial of Marvel Unlimited that is happening right now. 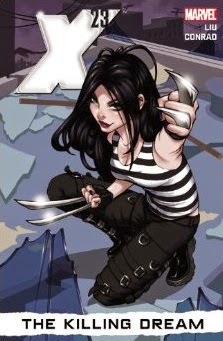 The art in X-23 was my least favourite by far. 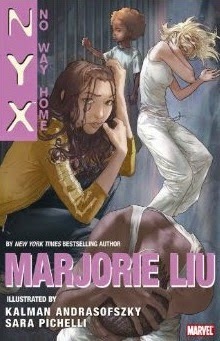 What was the other Marjorie Liu you read? Hope you enjoy Nyx and Generation Hope!